It was a great year for the annual Big Red Raffle! Special Olympics Nebraska athletes statewide raised over $120,000 for their team budgets in 2013. Thank you to everyone who purchased a ticket from an athlete - your support goes directly back to your local team and is the biggest fundraisers for many teams every year. 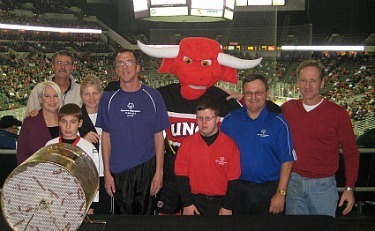 The winners were drawn at the UNO Mavericks vs. Minnesota State hockey game at the CenturyLink Center on December 14th. -Grand Prize Winner of 2 Husker Football season tickets was Mary Proctor of Peru, NE. -2nd Prize Winner of 2 Southwest Airline tickets was Joan O'Connor from TD Ameritrade. -3rd Prize Winner of 32" Flat Screen TV was Diane Wehrli of Blair, NE. Our athletes worked hard to sell tickets for months. One athlete from each of our four regions was awarded a prize for most tickets sold. Finally, Jon Norton of Wisner Pilger won our athlete drawing for a Kindle Fire! Thank you again to everyone who contributed to making this year's Big Red Raffle a success!